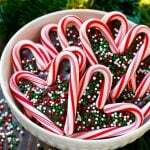 These adorable 3 ingredient candy cane hearts are a fun and festive treat! A super easy candy cane dessert that’s great for party favors, gifts and more. You can never go wrong with peppermint and chocolate! These candy cane hearts actually taste as good as they look. Sometimes you need an easy holiday treat that doesn’t use 15 ingredients and take 4 hours to make. These fun little candy cane hearts are always enthusiastically welcomed at any gathering, and they’ll only take you about 15 minutes to make. I love to package these guys up in little cellophane bags and hand them out to family and friends, they also make great holiday party favors and are perfect for classroom parties. My girls will be bringing them to school this year to give to their friends and teachers. 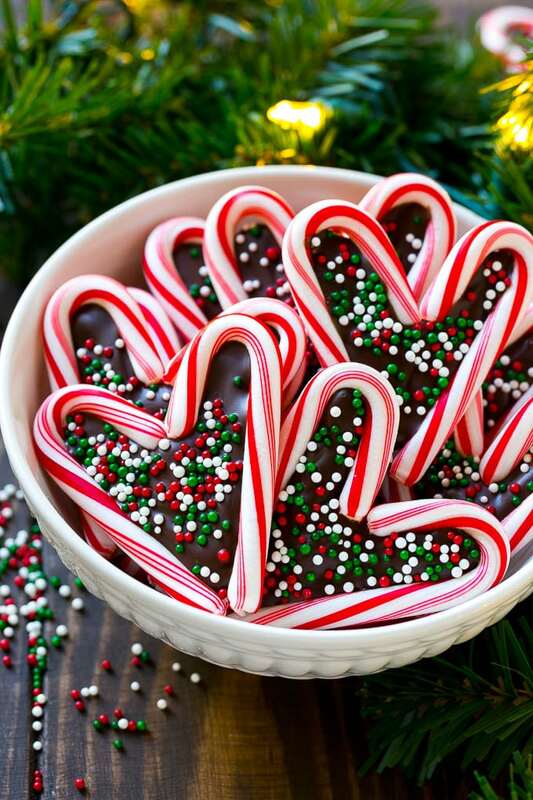 These candy cane hearts have just 3 ingredients: miniature candy canes, dark chocolate and holiday sprinkles. The first step is to arrange your candy canes into heart shapes on a piece of parchment paper. The next step is to melt some dark chocolate. I highly recommend using a dark chocolate candy melts or almond bark because they’ll dry smooth and shiny. If you use chocolate chips you might get a dull or white looking finish. While the chocolate is still wet, add your sprinkles of choice. I highly recommend using Ghirardelli brand candy melts as they melt to the perfect consistency and they taste the best of all the candy melt products on the market. I use a piping bag or a plastic bag with one of the corners snipped off to fill the hearts with the melted chocolate. Be careful not to overfill them! It can be a little different to pipe the chocolate into the smaller areas, so I just pipe a dollop in the middle and use a toothpick to fill in the point and curved parts of the hearts. The candy cane hearts set in about 10 minutes, and then you’re ready to go! Everyone will be so impressed by these fun and festive little treats, and they taste fabulous too. These adorable 3 ingredient candy cane hearts are a fun and festive treat! A super easy candy cane dessert that's great for party favors, gifts and more. Arrange the candy canes into 12 hearts on a sheet of parchment paper. Melt the candy melts in the microwave in 30 second increments until melted. Stir until smooth. Pour the candy melts into a piping bag or a plastic bag. Snip the tip off the piping bag or plastic bag. Pipe a dollop of chocolate into each heart. Use a toothpick to spread the chocolate into the point and curves of the heart. Add sprinkles while the chocolate is still wet, work quickly! Let sit until firm, then serve. how could you add a red ribbon to them to make them ornaments? You could try to poke a hole in the chocolate part, but I’m afraid they might soften and melt in a warm house. Sounds like a perfect addition to a candy tray! Question: can they be made ahead and frozen? Or will the candy canes get gooey upon thawing? These cannot be frozen because you’re correct, the candy cane will get gooey. That being said, you can make them days in advance and they should hold up fine at room temperature! 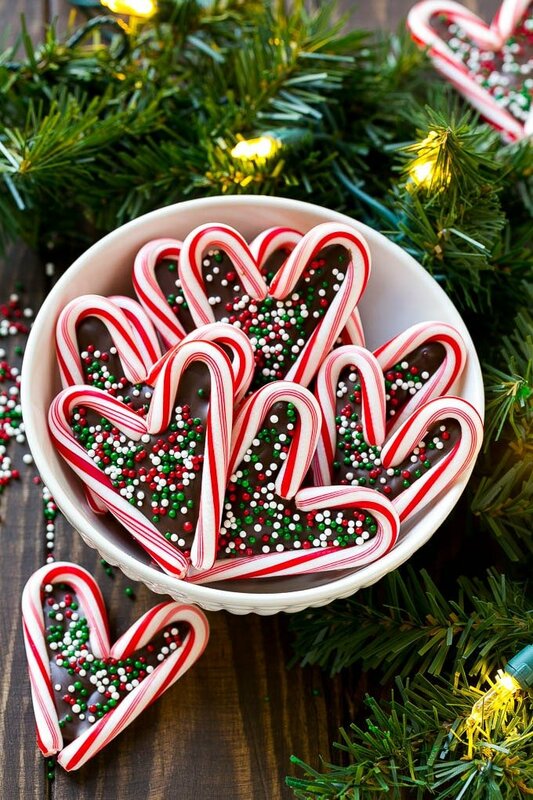 These candy cane hearts are so cute! It is also so easy to make! I am happy the recipe calls for dark chocolate. That’s a whole lot healthier. I love the way these candy cane hearts look! I would love to try making these sometime in our home. These candy cane hearts are so cute. They are a perfect holiday treat. 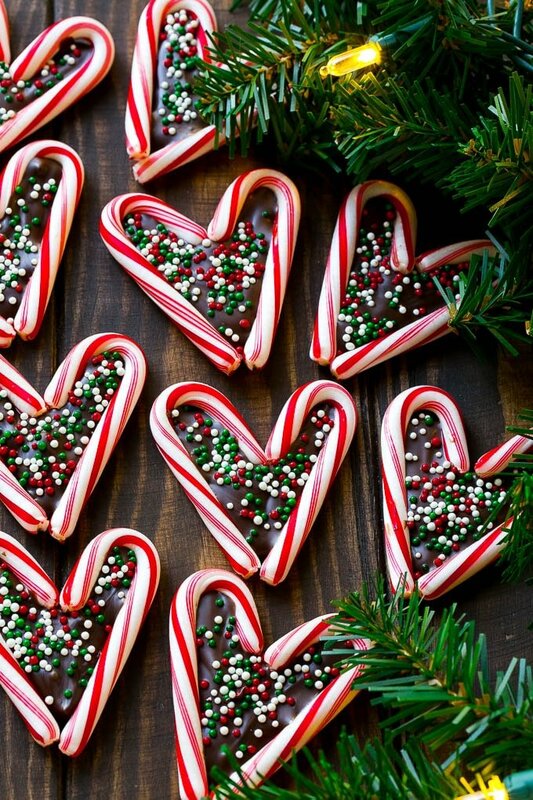 These candy cane hearts look so pretty! They’d make for great treats for the kids and sweet-toothed adults too. I love that they are easy to make. I’m going to try your recipe soon. What a fun idea and my kids could even help me make these, would make great teacher gifts. How cute and delicious! This will be a fun food craft for my girls to make to include in our holiday cookie boxes this year. Oh ! Now this sounds fun to make! I love that it takes only 10 minutes for the chocolate to harden, and only 3 ingredients! 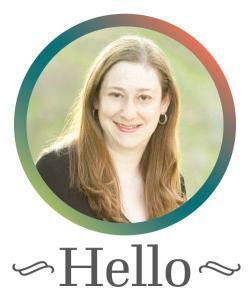 I’ll be bookmarking this so I can make it. I would love to make this for the family this holidays! It’s also a nice gift to neighbors or friends! It’s really easy to make so you won’t be stressing about it. What a lovely treat for the holidays! I super appreciate that they’re easy to make and they don’t require a lot of ingredients either! This is the cutest peppermint-chocolate combo ever! I’d love to make some of these adorable treats. Those are so super cute and did I read it right? Just 95 calories each? This is a great snack to have for the holidays! I love that all you need is three ingredients to make this! I’m sure the kid will have fun helping out in the kitchen and it would be a nice treat for their friends or classmates! These are so cute and look delicious. I will have to make some up for the holidays. I am sure they will be a big hit. What a tasty looking recipe and perfect for the holidays. I love chocolate and peppermint mixed together. Such a delicious combination. Nothing says Christmas like candy canes and chocolate! I love both, and making these would be awesome! I have to make these for the kids. Christmas is one of those times of the year where I let my kids eat ALL the treats, and these are just so cute! Those are super cute! Candy canes are so classically Christmas. I can’t wait to make these! They look yummy. I love candy cane hearts. I make them every winter to put on my brownies! !